Well, today marks the end of The Stationery Show, which featured all sorts of great paper-crafted projects throughout the month showcasing the many fun aspects of stationery. As I mentioned earlier, I have always had an affinity for stationery sets. I collect the ones with pretty motifs, that are in lovely packaging, and are either trendy or nostalgic. For today's project, I combined pretty motifs and trendy designs to stamp a coordinating stationery set, complete with matching envelopes using stamps from Avocado Arts. Quatrefoil's are so trendy and stylish right now. 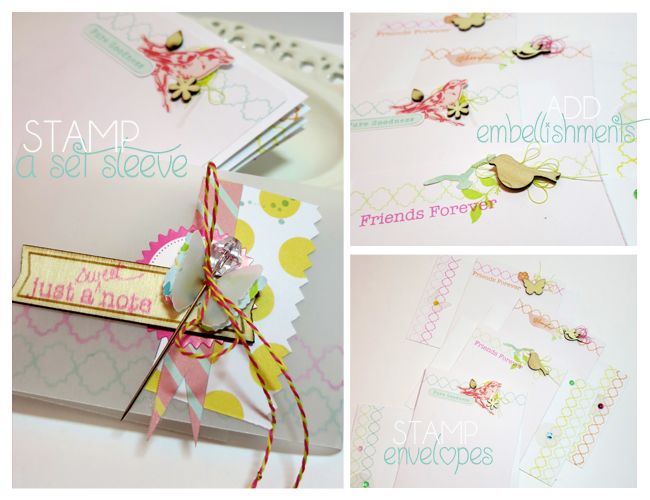 Avocado Arts makes a great border quatrefoil stamp that I stamped on all the envelopes, stationery and the stamp set sleeve. By using a simple motif, and repeating it throughout a set, you maintain unity, but can also add some more details without overdoing it. I also repeated the design of the stationery, only changing ink colors, stickers and veneers. Stationery can be flat, but try adding a little dimension with simple embellishments like wood veneers, sequins and thread. I think it makes the stationery really pop off the page! Like the vellum sleeve? Stay tuned next month when I show you how to use vellum and transparent overlays in your paper-crafting and stamped projects! That's it for me! Make sure to check out the other Pit Crew loveliness today! So stunning and elegant! I love them.